​​By going through Brother CE1100PRW Reviews, we will know about all the positives and negatives about Brother CE1100 Sewing machine. We will bring "a sense of being sure" about this product for those who want to purchase this particular machine. Not just the benefits, but we will also put light upon problems and their respective solutions. 1.1 ​Brother CE1100prw reviews: a brief info about the company Brother. ​Brother CE1100prw reviews: a brief info about the company Brother. ​Brother is a company whose Name and Fame are big in the market of sewing machines. It is a well-Trusted and dependable brand, and it always comes up with innovations regarding technology, features, etc. all things related to sewing machines. It successfully attracts a lot of customers by its every single launch that it does after a regular interval of time. This company cares a lot about sewers. ​Brother has launched limited "Project Runway" sewing machines, and brother CE1100PRW is the same kind. Brother Project Runaway machines have most of the times in demand, and so is Brother CE1100PRW. It won't be too much if we say that Brother CE1100PRW is probably the best and most satisfying creation in this particular " Project Runaway" department. While going through Brother Project Runaway CE1100PRW Reviews, we will unleash a lot about the excellence of this machine. ​Ce1100PRW is one of those sewing machines, which are although electronic sewing machine, but not fully computerized. It starts impressing right from the beginning when we come to know about its key features. It has a total of 100 Built-In stitches, so user will be having more than enough options to select. It includes eight types of 1-Step Auto-Size buttonholes along with a sewing Arm which helps out in sewing Sleeves and Cuffs. Computerized Stitch selection is present which is displayed on the LCD screen. Seven -point Feed Dogs Drop Feed which support free motion Quilting and an easy to operate Feed system. Besides all that, Drop-In top Bobbin is also present. Max stitch width is 7mm and stitch length is 5mm. ​This is a sewing machine that has fully satisfied above 90% of its users. You can hardly find a negative remark related to this machine. Still, we have to mention the cons of this machine, no matter how small. Its reviews are pretty high, so lets put light on its positives first. 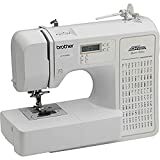 ​It is counted among most comfortable sewing machine to learn on as its controls and adjustments are easy to understand. One does not need to have the experience to start working on this machine. All required is just having a look at the user's manual provided along with it. After that, even a fresher can start on with his project. A DVD is always there for benefiting the beginners. Brother company is known for putting easy features in the machines, so most of its products are suitable for beginners as well. ​A lot of feet provided along-with this sewing machine helps in the best way. Besides that, it gives the option to select among 100 Built-In stitches which increases the creativity level of the user and helps him develop his tactics and standards. It is motivating. One-Step buttonholes feature is excellent. You can easily monitor the Bobbin thread supply through the clear cover. Manual thread cutter simplifies the task. Free motion quilting is made comfortable with a lever that drops the feed dogs.Free arm lets you work effortlessly of Cuffs and sleeves. Besides that, this machine is fast with a top speed of 850 stitches per minute. ​Although it is loaded with so many options and features, still designers of this machine have been successful in making it easily portable. 10.58 lbs is its weight and you will not face a single piece of difficulty in picking it up and moving to other place. Its portability ensures that you just don't need to get stick to one place to work. It is 11.65 x 7.01 x 16.26 inches in measurement. Too small for sure. You will not have to worry about deciding a place to store it, as this small machine can fit anywhere without acquiring too much space. ​Brother CE1100PRW is built with high-quality material, and because of that, it is highly durable. The durability of sewing machines depends much upon its maintenance and proper usage. One can do the necessary cleaning with a soft dry cloth after use. This machine doesn't need upgrading at regular times as well. Besides that, it will only need upgrading if you work on too much with heavier fabrics and materials like leather and denim. Proper needle selection is necessary while working on heavier fabrics. This machine, being a low price machine, will be with you for a very long time if used in a proper way. Besides that, it's parts are built strong enough, that hardly a situation rises to replace them. ​This machine is fast enough, and at the same time, it nails up the neatness as well. It stitches evenly and in a smooth manner. No one can question its quality of work, that is the reason why beginners feel awesome on this machine, as messing up with work never happens. Its clean work motivates the user. ​This machine doesn't have much complainers because it is perfect in many ways. Still few users felt some kinds of difficulties and few were in need of betterment of this sewing machines. So, let's have a look at the cons of this particular sewing machine, shall we? ​This one is the basic complaint of some users that LED work light is dull. It becomes difficult to read it in specific lighting conditions. One case has happened that after almost an hour of working, LCD was having a black line at the middle. The user was not able to figure out that on which stitch was he working on and which stitch he has changed to. This is probably only part of this sewing machine on which designers need to concentrate and bring proper change as well. ​Although the whole machine is made up of the perfect material, the spool is a delicate part of the machine. It might get damaged just by a little bit of rough handling. It is demanded that spool must be made from a better material rather than cheap quality plastic. We hope that the company brings a change here. ​A couple of users found it that there is the problem is doing decorative stitches for a longer time. One user said that sewing machine was doing OK with decorative stitches for a short time, but after that, all consistency with length and width was gone. One user found the problem that some stitches looked repetitive. ​This is not a fundamental problem with this machine. It is a rare case, and after all, its a machine, one or two problems might occur with possibilities that some or the other part of the machine are not working well. There is no need to panic. If any of its parts are malfunctioning, then machine needs to be carried to some sewing machine repair expert. Normal problems can be sorted out by our own hands, but if you don't have the exact idea about why is it malfunctioning or how to fix it, then trying to sort out the problem may lead to increase it. 25 Years warranty is in your favor for replacing parts of the machine which are not working well. Stitch repetition might happen because of using wrong foot or wrong technique of pedaling as well. ​One user complaint that this machine is not that good for learners. She mentioned that it was difficult to learn and sew on this machine. The Thread tension was not right always. Even machine was jamming in between. Besides that, the computerized chart was not cent percent accurate. ​First of all, more than 95% of its user agree with the fact that it is a user-friendly machine and very good for beginners as well. That is a massive proportion for sure. If problems mentioned in the paragraph above this one occur, then surely there is a manufacturing fault. It has to do nothing with its ability to be a good one for beginners. If you feel that there is a manufacturing default, then you can contact the helpline number of company and your machine will be replaced for free. Just for knowledge, there are below 0.5% of chances that a machine with a manufacturing fault is delivered to the customer. ​This is a sewing machine that is built to please everyone. There are very few sewing machines is market whose reviews are even better than Brother CE1100​PRW reviews. Not a single thing in the machine is left deficient. Just two small cons are what this machine is having. In contrast, 8 Big advantages it is giving. This machine is just incomparable. One can hardly find a sewing machine which can satisfy this much being low at a price. In short, one cannot demand more than this. Highly durable and low maintenance. After having a full look over this machine, this machine has got all essential features, and this one is probably the best of its kind. It has pleased more than 90% of its users, and that is enough for one to understand that Brother CE1100PRW project runway sewing machine is entirely worthy of purchase.